An exhibition held at the University of East Anglia, Sainsbury Centre for Visual Arts featuring some of the most innovative works acquired from the V&A collection of contemporary photography during the last ten years. The exhibition comprises of 44 images showing a broad range of styles by both internationally well-known names and emerging talents. It covers a period during which photography has taken centre stage in the world of contemporary art. Vik Muniz takes well known images that have become familiar through reproductions and recreates them from memory, using household materials such as sugar, chocolate and tread. He then makes a photographic record of his drawing. 'In Action Photo (Black and White)' we see an image of the painter Jackson Pollock recreated in chocolate syrup, the sticky sauce echoing the characteristic drips of paint in Pollock’s work. David Hockney has often used photography along side drawing and painting to question the nature of perception. In 'Photography Is Dead, Long Live Painting' Hockney playfully examines the illusion and traditions of painting and photography side by side. 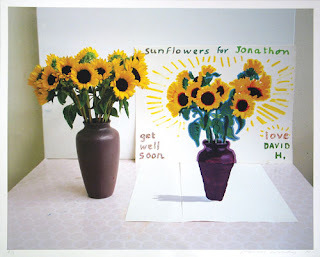 Undoubtedly referencing van Gogh, a 'real' vase of sunflowers sits next to a painted version, which is arranged to appear in the correct perspective for the camera. Painting the photo on watercolour paper provides a further twist. If your interested in Hockney, there is a museum of his work situated about 20 minutes from Leeds on the train in the town of Saltaire.